May Pang is not a musician or artist per se. She was the companion of John Lennon for 18 months in the mid-‘70s, giving unique insight, which runs counter to the “myth” of John’s so-called “lost weekend”. Some detractors might lump May Pang into the same category as such questionable Beatles authors as Albert Goldman and Geoffrey Giuliano - maybe this is just "guilt by association". However, unlike these two, May was actually there. I talked to May about her life with and without John and her current projects. E.C. : The day after I first contacted you about an interview in EAR CANDY was when George Harrison passed. Any special memories of George, I know he was mentioned in your book a couple of times? May: I hold a special place in my heart for George. George was very happy that I was with John and told us both so - he definitely spoke what was on his mind. I was just reminiscing that time with Tom Scott the other day. I met Tom on that Dark Horse Tour when he played with George and Ravi. We've remained friends since that time. E.C. : Speaking of your book, "Loving John" (on Warners Books 1983, later re-titled and updated "John Lennon: The Lost Weekend" on SPI Books 1992), what is the status? Will it ever be reprinted? May: I am not sure if I will have the book reprinted, although I was seriously considering it. I know many people have asked me where to get copies of it. The original book titled "Loving John" can be found in the library. E.C. : Did you keep any kind of diary of your time with John? Or was the your book mainly from memory? Also, any chance of a second volume of new material? May: I never kept a diary. I had excellent memory mainly because I didn't drink or take drugs - my main vice was drinking Coca-Cola. There are plenty more stories to be told and I am considering putting those stories down in print. E.C. : In your book you said that, "John felt most secure when his life was the most childlike...and he went back to an environment in which his needs were controlled." This seems to sum up a lot about John and explains allot of his behavior. Why do you think this simple fact is missing from most Lennon biographies? I find it quite annoying that people try to deify John, rather than portraying him as a real person who had real weaknesses and flaws. May: Most people considered John a "legend" or "hero"; with that comes a larger than life image. Showing his childlike side and his vulnerabilities would not fare well in the biographies - they didn't want to see John with human frailties. E.C. : I was suprised to see your appearance in the 1988 film, "Imagine". That was a Yoko Ono project of 'damage control' for the Goldman book, correct? May: I'm sure Andrew Solt who produced and directed the film had to deal with the issue of my appearance. Not having me on the film would have been quite obvious as to really who controlled the project. It was not like a "long lost weekend" but over a year and half relationship of living together but all total a 10-year friendship. E.C. : Speaking of films, "John and Yoko a Love Story" (the TV movie) seemed to tow the line regarding John's 'lost weekend' and his 'househusband' years. Do you think we'll ever see an accurate portrayal of John on film? May: At this point in time, not for a while. E.C. : I've recently heard the bootleg, "A Toot and a Snore", which is of the famous recording session of John and Paul in 1974 (which is mentioned in your book). A version of "Lucille" is on the record, but not the version of "Midnight Special" which you mentioned in your book. Paul recently mentioned that "Midnight Special" was recorded. Have you heard any of the tapes from this session? May: I have not heard anything from that session in years. I can still hear the jam in my head like it was yesterday. I know people have commented on how awful it sounded - what everyone forgets is that it was not intended for recording but just a fun jam after a first day of a Harry Nilsson recording session. Fans need to back off on criticism for this bootleg. It was not a recording session, just everyone getting together, relaxing and having fun - what is wrong with that? E.C. : On your webpage, you mention acting. What acting projects have you been involved in? May: I did some work on some movies and TV shows - Law & Order, The Equalizer, Heartburn, lots of others which I can't remember anymore since I haven't done the acting bit in over 13 years. E.C. : I know that Paul McCartney (and even Sean Lennon) is a great fan of Brian Wilson and the Beach Boys stuff in the mid-sixties. But, I never recall having read that John Lennon was all that influenced by Wilson and the Beach Boys. So, my question is this: did John ever mention the Beach Boys and/or Brian Wilson in any casual conversations about music and what influenced him (or what current music he liked)? May: It was Paul McCartney who considered the Beach Boys' PET SOUNDS as one of the greatest albums of all time. He was indeed inspired by Brian’s songwriting and the bass playing (and sound of the bass) on this album to create "something substantial" and he went on to create SGT. PEPPER. Years later, Paul visited Brian at his home and he brought out the Good Vibrations master tape for Paul to hear. Brian kept "remixing" the tape over and over and never got passed the first verse of the song. Brian was obsessed with trying to make it better. Apparently, this situation happened a lot to those who visited Brian at his home. John liked The Beach Boys as well and we met Dennis Wilson at a restaurant in Los Angeles. Months later, we attended a birthday party for Dean Martin's youngest son, Ricci, and all The Beach Boys were there, including Brian, which thrilled John among other amazing guests that night. E.C. : Julian Lennon's 1999 PHOTOGRAPH SMILE is easily his best album, what did you think of it? Have you kept contact with Julian over the years? May: I haven't heard Julian's Photograph Smile CD. I saw him in August 1999 when he appeared at Irving Plaza. I would run into him every so often. I saw his mum, Cynthia, earlier this year too. E.C. : Here's a "what if" question - if John had lived, do you think there ever would have been a full Beatles collaboration? An expanded version of the 1995 "Free As a Bird"/"Real Love" session? May: What a lot of people don't know is just before John and I split from one another, he wanted to know from me if he should collaborate with Paul again and was it a good idea. Can you imagine that? I gave him the best reason to do it, and that was because they would want to do it and no one forcing them. I almost did get them together. We were planning on visiting The Macs in New Orleans but somehow John got sidetracked and he went back to the Dakota. E.C. 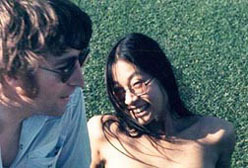 : Finally, I heard that you are compiling a Lennon photo book using your own personal photos. Can you describe the project? May: I am just beginning to put my personal photos together, it is a side of John that no one has seen. It should be fun. I have great memories and the stories to go with it. E.C. : Have you thought of a title? Have you approached any publishers and is there a "target" date for the book? May: Lots of titles have been suggested for the book but I want to see the end product and get the feel before it has its final name on it. I haven't approached any publishers yet. I would like this book out sometime this year.